Available with dealer imprint. Qty price breaks available. Online ordering not available. For more info call or email: forms@watda.org. 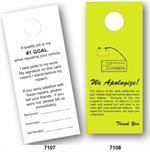 Hangs on rearview mirror and is an excellent way to communicate with your customer. Starting price listed above. 1 or 2-color printing in Red, Blue, Black or Green ink. Other colors available at addtional charge. Hang Tag 3-2/3" x 8-1/2"